It's amazing how time passes! 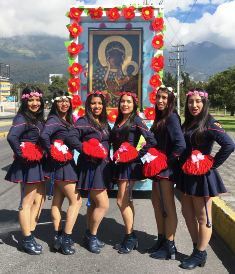 For a year now, the Pilgrim Icon of the Virgin of Czestochowa has been in Ecuador. Last year She was received with honors at the Mariscal Sucre International Airport, in Tababela, by Monsignor Danilo Echeverria, Auxiliary Bishop of Quito. The first event where the Icon was present was the march for life in the city of Santo Domingo, where She toured the entire diocese. 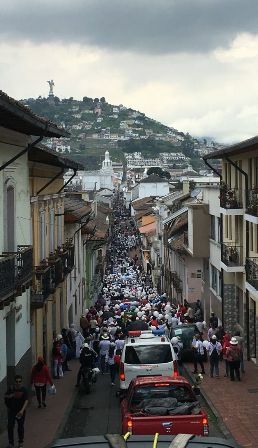 Now, a year later, the Icon also accompanied the defenders of human life in the city of Quito. The "Day of the child to be born" is celebrated internationally every March 25, just 9 months before the Nativity of the Lord. 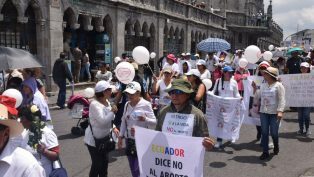 On Saturday the 24th, the Family Pastoral of the Archdiocese of Quito organized a civic march called "Love in Motion", in defense of life and family values. This walk left at 10h00 from El Arbolito Park to the Plaza Grande, in the Historic Center of the Ecuadorian capital. 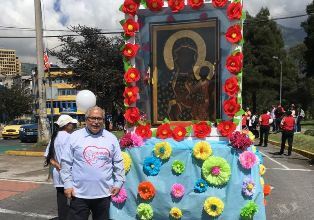 The march was led by the Peace Band of former students of the Saint Peter Pascual's School; followed by the Icon of Our Lady of Czestochowa in her Mama-Mobile adorned with flowers and escorted on both sides by young people of the John XXIII movement. Our Lady was followed by all the participants of the march for the next 10 to 12 blocks. 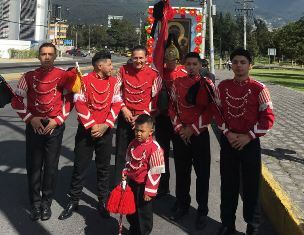 Edgar Heredia, member of the ecclesial movement Equipos de Nuestra Señora, participated in the organization of the event. "Everything was perfect, we had people with posters defending life and family and it was so good to have Our Lady with us. The people, although they did not know this image of the Virgin, came to pray in front of Her", he said. During the way the marchers chanted some pro-life phrases like: "Life is beautiful, bet on it", "Life begins at conception, not when the constitution says", and "My mother said yes, that's why I'm here". The civic march began and ended with a Hail Mary. 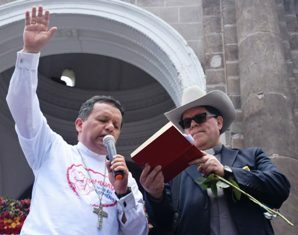 Upon arriving at the Plaza Grande, Bishop Echeverria, who is also President of the Family Pastoral of the Ecuadorian Episcopal Conference, blessed pregnant women and consecrated them to the Virgin Mary. He also prayed for families who cannot have children. Then the prayer of Saint John Paul II that is at the end of the encyclical Evangelium Vitae was recited. Bishop Danilo said a few words of thanks to the participants and encouraged them to have in mind God's mercy and forgiveness. He reminded the participants that "we have to highlight at all times the beauty of life, protecting and taking care of pregnant mothers, and extending our hands if necessary so that they do not feel alone".